Learning these repeatable skills will allow you to adjust, change, regroup, and reinvent yourself - indefinitely. This is an invaluable skill for teenagers who will soon be entering the gig economy. Combining long-term vision with the discipline to take the small, incremental, often mundane steps to achieve it. The stronger the vision, the easier it is to maintain discipline on the journey. For each of my stops, I had a clear vision of what I wanted - and why. Teenagers need to develop a clear vision of where they are going, why they are going there, what the benefits will be, and what steps are needed to succeed. The ability to doggedly hunt down people, places, and resources to find answers. In each of my transitions, I started from scratch. When I moved from Investment Banking to the U.S. Navy, I didn't know a single person in the military. Teenagers need to learn how to investigate, explore, and uncover answers to problems that need solving. Each new venture begins with some type of an application. This application is a direct reflection of you. It must be perfect - no errors, no sloppy work, no exaggeration, and on time. Attention to detail is paramount - especially in the competitive world of college admissions. Teenagers must learn this lesson early and college applications offer the perfect introduction. New endeavors typically require a "skill assessment test" (e.g. SAT/ACT for college, Series 7 for Investment Banking, ASVAB for Navy SEALs, GMAT for Harvard Business School, Civil Service Test for Firefighting, etc.). It's critical to learn how to find, register, and diligently prepare for these types of standardized tests. 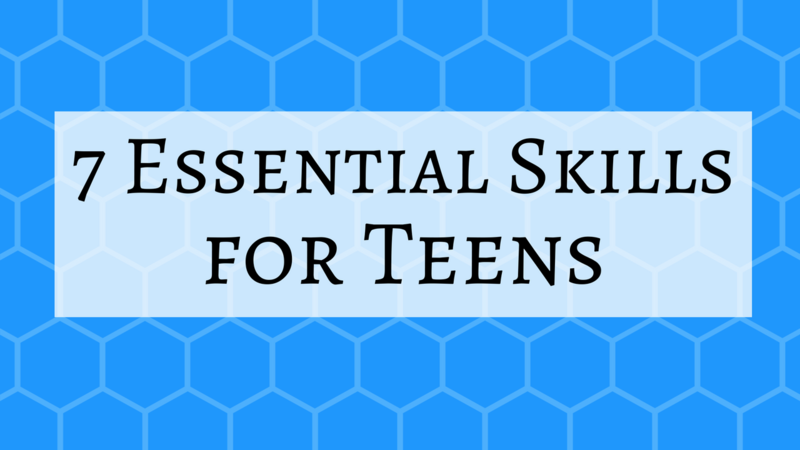 Teenagers have a great opportunity to develop this skill thanks to the SAT/ACT, AP Exams, SAT Subject Tests, etc. New ventures require novices to network with people in their chosen field. I had to identify, contact, and nurture relationships with Yale alumni, Investment Bankers, Navy SEALs, former Shark Tank contestants, etc. Teenagers must learn how to interact with people, handle unique social situations, and connect the dots. Nearly every new job requires some kind of writing sample (e.g. college essays and personal statements for undergraduate and graduate schools, resume writing, etc.). It is imperative to learn how to write well, succinctly, and with influence. Teenagers must make written communication skills a top priority, particularly in our new world of casual texting. Any significant venture usually requires a face-to-face interview prior to hiring. The ability to dress appropriately, answer questions intelligently, and demonstrate humility can (and should) be taught in high school. As competition mounts and interpersonal skills become key differentiators, teenagers have the opportunity to stand out by mastering "interview" skills. College interviews are the perfect training grounds to hone this skill. Unfortunately, there are no shortcuts, life hacks, or tricks to learning these skills. These are not skills acquired after a 12-minute meeting with a guidance counselor. These are not skills learned after talking to a private college counselor at the end of junior year in high school. These are essential skills that need to be taught, practiced, and repeated for years before stepping foot onto a college campus. These are the skills we teach in PrepWell Academy - and why we start the process in 9th grade. Teenagers need to see, hear, and integrate these important messages hundreds and hundreds of times during high school. That's why PrepWell Academy delivers digestible bits of guidance on a weekly basis. If you want your child to begin the important process of learning these skills, enroll in PrepWell Academy today.